The Shower Room (シャワールーム?, lit. : "Shower Room") is a cave found in the Perplexing Pool area of Pikmin 2, the sublevels of which are themed around tiled washrooms and piping systems. The boss of the cave is the Ranging Bloyster, and is of average difficulty. In the US version of this cave, there are 1220 Pokos worth of treasure. In the European version of this cave, there are 1240 Pokos worth of treasure. To the right of base is a large pond containing a Toady Bloyster. By going into this pond, you can find a bridge. Build this bridge, and use the ledge that was required in Pikmin to collect the Repair-type Bolt to bring Yellow Pikmin across the river, and have them destroy the electric gate. Use Blue Pikmin to destroy the clog, revealing the cave. A side effect of destroying the clog is that all Pikmin types can cross the river. There are few special considerations in terms of Pikmin squads. However, there are a few heavy treasures that might appear in water, making sufficient Blue Pikmin a must. “A large rock sits in a reservoir of water. May I interject here? I have been observing the two of you working together. You have been cooperating well. Yet, to face the dangers ahead, you must be free of the shackles of a boss-worker relationship! Learn to use X to separate and Y to change leaders. Electrical wires should block the paths, sometimes with Watery Blowhogs nearby. In this instace, Yellow Pikmin should still be used to shut off the generators because they can still be easily saved from any water. 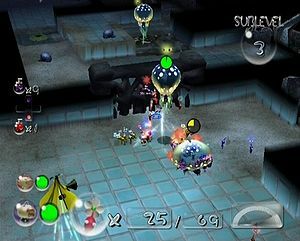 Apart from the enemies, some boulders may fall from the ceiling. However, the level has a simple layout, so the treasure should be easy to find. The Ivory Candypop Bud here only appears if the player has less than 20 White Pikmin in total. Oddly, Wogpoles will occasionally drop from the sky, but since they are not in water, they pose no problem to Pikmin. Apart from the boulders, Dwarf Orange Bulborbs fall from the ceiling as well. They could become a nuisance when attacking the Jellyfloat or the larger Orange Bulborb. The Violet Candypop Bud here will only appear if the player's total Purple Pikmin count is less than 20. Sometimes this level has 6-7 enemies all gathered in one spot; should this happen, a bitter spray would be recommended, or regenerating the level with reset. Be prepared for any Water Dumples that drop from above. A very large rest level. This is a unique level layout, only seen once in the main game mode. It appears to take the place in some pipes and under a street drainage vent. There are some Queen Candypop Buds here. Also, if you need to leave, there is a geyser available. Although water flows through the pipes, it is shallow enough so that any Pikmin type can pass through without any trouble. 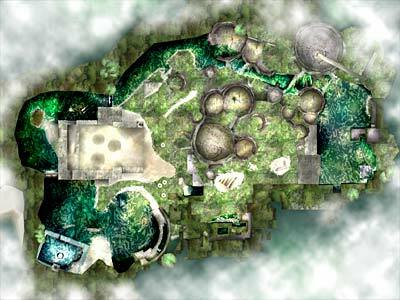 This rest level is also similar to the Hidden Garden, Challenge mode's twenty-third level, with a few minor changes. In rare occasions, a Fiery and a Withering Blowhog are behind a gate that must be destroyed to collect treasure. Not only does this mean that one should only use Red Pikmin, but that these will also be deflowered. Restarting this layout is highly recommended. Also, some fire geysers could pose a threat to non-Reds. The first thing one should do is set off the Volatile Dweevil that is hiding in one of the pipes. The Orange Bulborb may be sitting in front of the Rubber Ugly; also, just like the Volatile Dweevil, all Dweevils are hiding in the pipes, so they could take treasures that are being carried by Pikmin. One good way to deal with Dweevils is to throw a Purple Pikmin at or near it to stun it, but do not throw Purples at Volatile Dweevils, since the Pikmin will very likely be killed in the following explosion. See also: Ranging Bloyster strategy. Some gates have to be torn down to get to the Bloyster. Be careful, as sometimes its tentacles can reach through the gate. See the link above for a very effective strategy. The Shower Room is the only cave whose entrance is initially blocked off. This page was last edited on January 1, 2019, at 14:39.